Striped Mules | Blue Studded Loafers | Charlotte Tilbury Lipstick -Kim K.W. I find I'm all about the budget finds this time of year. I'm not exactly thrilled to be adding more winter items to my wardrobe but with no vacations planned anytime soon and spring feeling like it's eons away, when I need a quick shopping fix, budget items are my go-to. 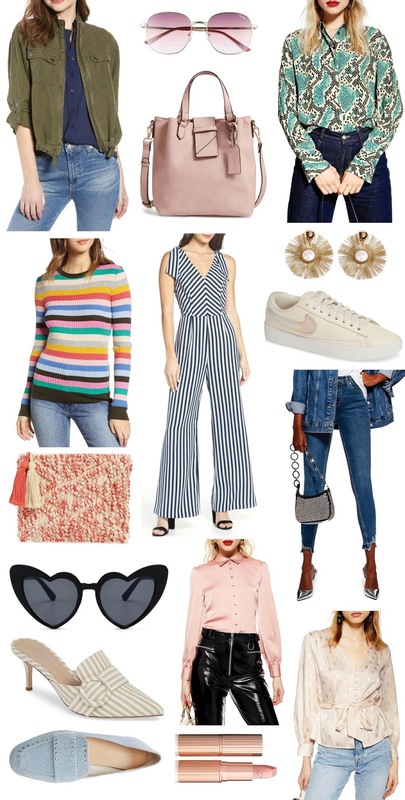 As mentioned, warmer weather isn't exactly around the corner but I try to keep an eye on spring/summer 2019 trends when starting to shop so I can incorporate my purchases now into outfits I'll be wearing up to August and September. Some of my favourite items as of late are anything snakeskin (and loving the coloured variation of this), bold and bright striped pieces, collared polos, rafia textured items and satin blouses. The items in the round up have me heart eyed and the best part? They're all under $100!